When I began dollshousering, over twenty years ago, I wanted miniature porcelain dolls that were as good as full size Victorian dolls in antique shops and museums. I wanted movable dolls with separate fingers, pierced ears and glass eyes. The hobby was called dolls' houses – I could see the houses, where were the proper dolls? So I made them. After a one day course in the basics I got started and within a few months was making my own moulds and my own original dolls. I immediately relocated the neck joint to the base of the skull so the head could turn and have been fascinated by jointing ever since. My early dolls had wired limbs covered with chamois leather; an in-scale equivalent to Victorian leather bodied fashion dolls that have lasted so well. At one show a lady bought a glass eyed man and at the next came to apologise that he was still sitting in a bedroom dressed in a paper bag. When she kept appearing, still worrying and other customers said they could make wigs but would prefer it if I did it for them, I knew what to tackle next. In addition to dressed dolls, I now make fully articulated all porcelain dolls in sizes from 18 inches to 2½ inches, in underwear, with brushable hair, that are lovely for dressing and just as lovely for leaving that way. 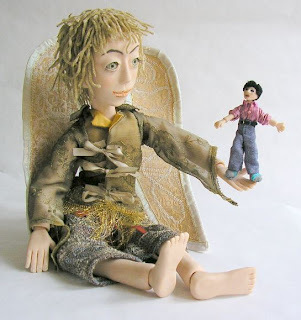 I also make wired, solid and simply jointed dressed and undressed dolls in sizes to 7mm. My dolls are made of porcelain; down to 24th scale adults they have hollow blown glass eyes that are specially made for me, that look at you. If your friends think you are a strange adult, dressing dolls, the dolls will look at you, and appreciate you. 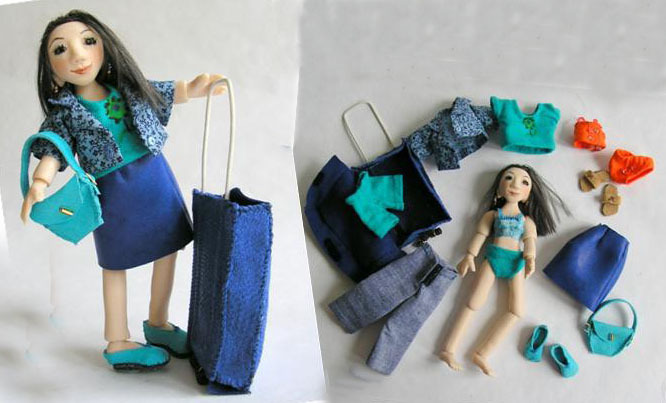 The latest are 12th scale dolls with a suitcase full of changeable clothes and 24th scale flexibly limbed children. My dolls are for adult collectors who will always find something new; it's the invention I enjoy. I sell at Miniatura and through my website, where you will also find humorous writing similar to my paper magazine contributions of the last 15 years.